Unfortunately, the timing belt in my car has failed. I was driving quite fast in the outside lane of a three lane motorway (the M50) when it happened. The engine simply stopped and the car immediately slowed down to a halt, but luckily I had enough time to indicate, change lanes and move on to the hard shoulder. There was no bang or loud noise when it happened, the engine just stopped working. The computer display in the car simply stated ‘check fuel injectors’, so I wasn’t sure it was the timing belt at first. But I suspected it as the belt was due to be changed. I had the car booked in to have it changed the following week. The tow truck took my car to the nearest garage where they confirmed that the timing belt failed; this surprised me a little as I thought that when a timing belt broke you would hear a loud bang, but not always as it turns out. The garage said it would be very costly to fix, depending on how much damage had been caused to the engine, but they couldn’t be sure of the final cost until the engine was opened up and inspected. This particular garage wasn’t close to where I lived, so I asked a local mechanic, who my friend knew and vouched for to look at it. He opened the engine up and found that while some damage had been caused, it luckily wasn’t as bad as expected. 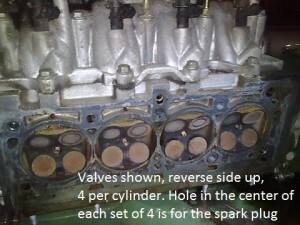 Four valves had been damaged. He is fixing it at the moment, but as I have learned a lot about timing belts in the last week, I thought I would share it with you all. A timing belt connects the camshaft to the crankshaft and keeps the engine valves opening and closing in time with the movement of the pistons. The belt itself is black toothed rubber belt which because of wear needs to be replaced at regular intervals. Why is it so catastrophic for the engine if it fails? Sometimes the engine can be so badly damaged by a timing belt failing that it is cheaper to replace the engine. 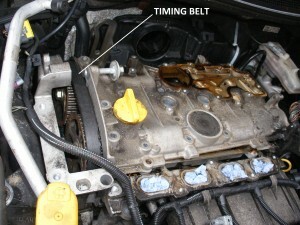 A belt failure damages the engine because the belt controls the timing of the opening and closing of the cylinder valves. Once the belt fails, the valves will remain in the position they were in at the instant the belt fails; but the pistons will continue to move, because of their momentum, and hit and damage any open valves. 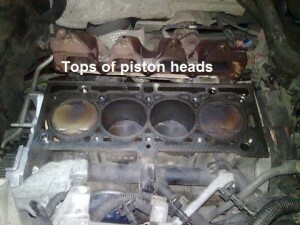 Sometimes, the pistons will hit the valves so hard that the camshaft will be damaged as well as the valves. This is when the mechanic starts talking about replacing your engine with a second hand one. Modern cars have 16 valves, four per cylinder. Two are to let fuel into the cylinder and two are to remove exhaust gases. Why are timing belts not designed to last as long as the car? Timing belts are made from rubber because it is lighter and quieter than any other alternative like a chain. A rubber timing belt doesn’t rust or require oil, whereas a chain would, but it does need to be changed at regular intervals. The timing belt in my car also powers the water pump, and is usually changed at the same time as the belt. Does it actually snap when it fails? When the belt fails it is unlikely to actually snap, instead it is more likely that the teeth of the belt will break off. The following is a good animation from YouTube of an engine which shows how the timing belt operates and is connected to the valves by the camshafts. Below are pictures of the inside of the engine of my own car, with the relevant parts. My advice, for what its worth, is to have your timing belt checked and replaced when your mechanic/garage says to and not when it suits you. Also if buying a second hand car you should make sure you receive written proof when the timing belt was last changed. The final cost to fix my timing belt was €750, but the dealer who I didn’t use quoted me between €1,500 and €2,000. My timing belt is due must book it in. Just one thing if a mechanic offers to inspect the timing belt it is pretty meaningless as the belt need to be just replaced at the intervals specified by the car manufacturer. Also never accept just a belt replacement the water pump and belt tensioner should also be replaced. Good advice, you are right, there may be internal wear to the belt not visible on the surface. I just had an Engine replaced as the chain belt was not good Cost to replace an Engine in my V Corsa Was. Two Thousend Seven Hundred fifty eight pound and twelv pence ? My timing belt just went on a Ford Galaxy; I didn’t realise that the Galaxy has two timing belts, the main one and one that sits in a full contained unit that is full of oil. I had the main timing belt replaced to avoid this issue and for some reason the mechanic didn’t replace this belt that is in oil (perhaps he didn’t know it existed, and I wasn’t experienced enough to know this as well). Anyway, the damage was immense; and I had to get a new engine as the valve heads and piston chamber was damaged beyond repair. Total cost of €2200 and this was mates rates; to put in a second hand engine plus new timing belt kit. – change it at less than recommended mileage (mine went at 100k, recommended was 120k on Galaxy). – ask the mechanic to change all the components, so all timing belts (if >1 exists) plus the water pump. The timing belt in the oil is now a chain; so these last longer apparently. Try the You-Tube video by the guy who owns the taxi firm, who bought a fleet of Mondeo’s with the TDi 1.7 litre engines that have the same internal belt as your Galaxy. Mine just went also. This guy lost 1 Mondeo from his fleet, so had it checked (after failure) and his mechanic recommended replacing all of the fleet with the alternative chain and sprocket set available online (you’ll need to watch his YT video to get website address). Cost, fitted was around £1,500..!! Ouch. On plus side, his first 400,00 miles was clocked up recently, so he rates this chain system for the oil immersed belt. These cars are dropping like flies at or before 100,00 miles, so if you love the engine (I did), I recommend you do take action to lengthen the life-time of your engine, preferably to a likely age that’s much nearer the likely lifetime of the rest of the car. Otherwise,, you are probably driving (perhaps unknowingly) in a drivable (for a short while) scrap item. After failure, the care will be worth a couple of hundred squids if you’re lucky. Thanks but I took the facebook like button off the site. It was slowing down the website a little. You can use the facebook share button instead if you like. Ahh the Beauty of good engineering. Many toyota’s (and other models) have what is called a “non – interference” engine, where the valves and pistons cannot contact even in the event of a timing belt snap. Why more manufacturers don’t use this approach is beyond me. I just after replacing 8 valves in my 2011 saab 95. I bought it 7 months ago and was told belt was done . Yep problem here was 2 yrs ago when car had 135,000 km done . Garage never changed it 100k later . It’s cost me know apprx €1400 now . As I was mislead at sale the garage never changed the belt but told me apprx €1600 Euro of service work done . I do think I still have a case to follow the Garage who sold me this car that cost apprx €14k with a false service record. I was driving my Renault scenic 2007 when it suddenly slowed down and stopped will not turn back on at all got it towed to the garage they have told me it is the timing belt but have no idea if there is any other damage to the car is there any way I could find this out? Unfortunately, the only way to definitively determine damage to the engine is to open up the engine case and inspect the interior for damage. Damage can range anywhere from minimal marring on valves all the way to cracked engine blocks. Visualize that, while the piston heads and connecting rods in modern engines are made to be lightweight, the momentum mentioned in the article takes place at thousands of revolutions every minute. It’s not the weight of the piston head striking the valves that causes the damage, it’s the speed. 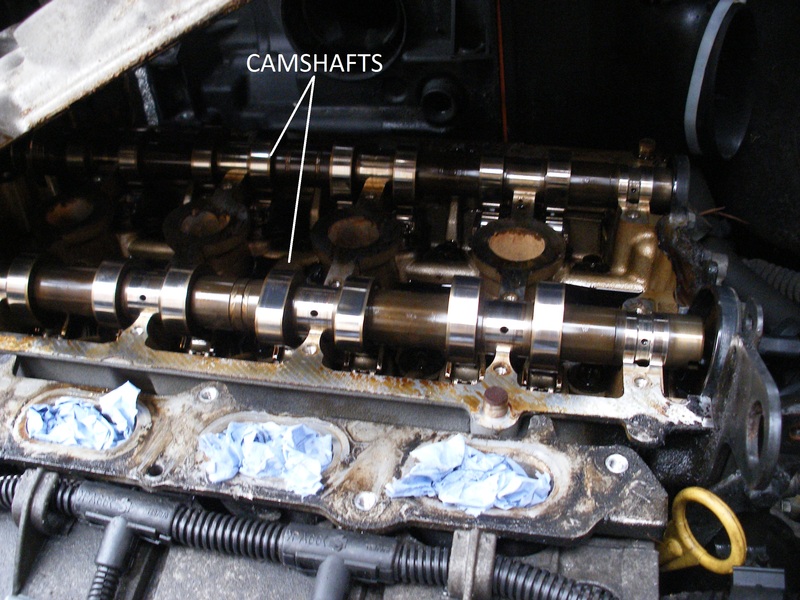 An alternative to this is aligning the cam shafts, replacing the timing belt, and turning the engine over to see what happens, but this may cause additional damage. For this reason, it is unlikely to find a mechanic who would ever recommend this method. A timing belt of a car is nothing but a rubber belt that is placed in a specific configuration along one side of the car engine to keep the crank and camshafts timed synchronously. It helps in keeping the top half of the engine in synchronous with its bottom half. If it fails to work, so does our car engine causing our car to shut down. I went through the blog thoroughly and I liked the portion that was being described with the function of timing belt and the extent of damage caused by its failure very much. So, for me the blog was quite appreciating. For more knowledge one can contact us at https://myeuropro.com/ . Thank you. The timing belt is just a rubber belt present in a car’s engine compartment. The part keeps the crankshaft synchronized with camshafts. The belt needs proper care and replacement at right time. It is quite dangerous if the belt fails on the road. You cannot imagine when the issue happens with you. So, you should check the component in-betweens with experienced technicians like- http://daseuropeanautohaus.com/ . You should always be in touch with them and ask for suggestions, if it happens. The YouTube video linked here thoroughly describes the functioning of the timing belt in vehicles. A timing belt in the matchless condition keeps your speculation performing smoothly and helps in keeping the fuel efficiency at the optimal level. This is the component that adjusts and organizes various functions of your speed machine’s under-hood. The anticipated lifespan of the timing belt is particular to the automobile and it depends on the configuration of the motor. Like other components, it does not need maintenance too often. In fact, it is susceptible to deterioration, as the motor car ages. If you have covered more than 70K miles, and if you observe the signs of a timing belt’s malfunction, then contact an authorized car mechanic, and replace the timing belt immediately in order to keep your engine performance in the peak condition and to remain trouble-free while driving. You can refer this page- https://glenwoodforeigncar.com/about_glenwood_foreign_car/ to know more about professional car technicians. A timing belt is an important part of the vehicle which synchronizes the rotational time of crankshaft and camshaft. However, it has an expiry date and hence it needs regular inspection. Use of an older timing belt could have a disastrous effect on the performance of the engine. So, the condition of the timing belt should be inspected regularly and if necessary should be replaced with suitable substitutes.